How many times have you wished that there was a way to just drive & pick up your groceries without having to go in to the grocery store – like a grocery store drive- thru? As a mom, I can’t tell you how many times that thought has crossed my mind, especially when my girls were younger. The thought of having to get both girls in & out of the carseats, deal with the frequent drama that often involved taking little ones to the grocery store, and trying to concentrate & remember everything on my list meant that I most often shopped when the girls were asleep and it was late at night. I know many of you have probably had the same thought about grocery shopping at some point – where you wish you could just drive up & pick up your groceries instead of spending the time to go thru the whole store & shop for what you need. 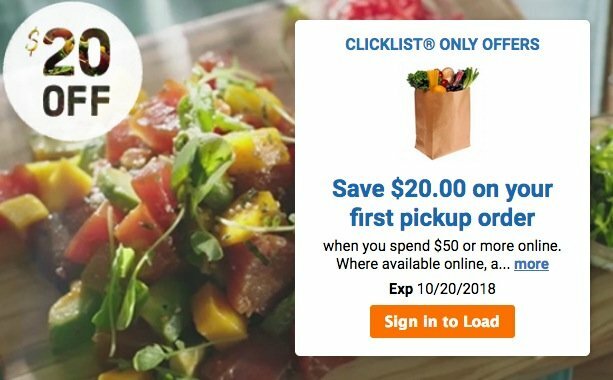 The good news is that local Fred Meyer stores in the Northwest (& select Kroger store locations around the country) have launched a new online grocery curbside service called ClickList. 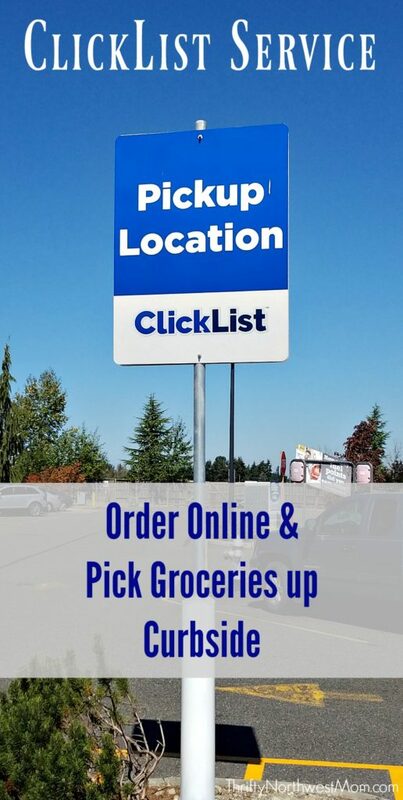 ClickList is a way that you can order grocery items online and then drive to Fred Meyer to have them delivered right to your car curbside. PLUS, through 10/20 you can get a coupon good for $20 off an online order of $50+ for your first ClickList order! Find the coupon here. This is awesome as you can still use other ClickList ecoupons on your order too, so you can save big on groceries with this coupon! Once you have loaded the coupon on the Kroger site, it should be added to your “My Coupons” section on the Fred Meyer site. The beauty of this is that you don’t ever have to go in the store. They will bring your groceries out to you in your car after you arrive to let them know you are there for pickup. There is a $4.95 fee for this service, but the first 3 times you use the ClickList service, this fee will be waived. But honestly, if you’re having one of those days where you just need to get your grocery shopping done from the comfort of your own home & not have to run into the store for your grocery shopping, I think the convenience could definitely be very worth that small fee. Plus, most of us tend to add items to our groceries as we shop even if you are strict about a list, so this really helps keep you only buying things you need (not those spontaneous items), so it could help you save more money in the end, even with paying that small fee. For busy individuals or families, I also think this could be a major time-saver, too. You can do your grocery shopping when you have some down time like later in the evening while you’re watching tv or even sitting in the school pick-up line or waiting for your child to get out of fall sports. Then just run to Fred Meyer to have them deliver the groceries right to your car. Such a huge time-saver for sure, especially so you don’t have to head into the store during the busy dinner hour rush when there could be a wait in line to buy your groceries, too. ClickList is available not just for Fred Meyer but select Kroger Family of stores locations around the nation. You can login to ClickList to see if there is a location near you. They have been expanding all month (in fact, my Puyallup location just opened last week), so check back frequently if your store location is not listed yet. Head to ClickList on the Fred Meyer website and sign in to your Fred Meyer account. 2. First, you will want to select the location for pickup (as products can vary slightly based on the store location, so you want to do this first. At the top, you will see where it will assign a location near you. Or you can click “Change” to see other locations and choose one closer to you. 3. You can also choose the pickup time – typically it is the next day so you do need to plan ahead a little bit (I ordered in the morning & the next pickup time was the following morning) & you have an hour window of time to pick up your order. 4. Once you’ve chosen your store & pickup time, you’re ready to shop! There are more than 40,000 grocery items you can shop for on ClickList. Everything from fresh produce, meat, seafood, dairy, frozen products & more! Even if you have not ordered from ClickList before, they will use your buying history using your Rewards card account to show your favorite items you buy regularly at the store so you can choose those quickly if you’d like. Or you can shop by category or search bar & choose your items that way. The prices are the exact same as what you would find in the store shopping – you are not paying more for shopping online! 6. Select the items you want to buy and add to your cart. If you have any digital coupons loaded to your card (add these separately thru the Fred Meyer website ahead of time), these will be taken off your order automatically. If you have any paper coupons or other discounts, they will ask you when you arrive to pick up your groceries, if you are using any coupons & they will take those at that time. 7. Checkout once you have found all the items you wish to order. At this time, you will pay the ClickList attendant when you pickup your groceries. They will give you an estimated total (this is due to the fact that the exact amount will vary slightly based on the produce, meat, seafood, etc items selected). 8. On the day of pickup, you will receive an email from ClickList with instructions on picking up your order. 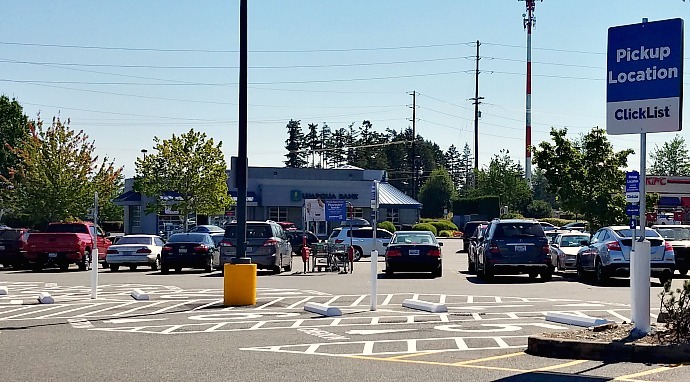 It’s very simple – you will just drive to Fred Meyer & they will have a specific Click-List Pick-Up area. The sign in the parking spot will give you instructions to call & let them know you have arrived. They will ask if you have any coupons or other discounts & then bring out your order to your car. You will need to pay by credit or debit to the attendant. How simple is that! There are currently over 15 Fred Meyer ClickList locations all around the Northwest – mainly Washington & Oregon, with one Idaho location. But it is definitely expanding as my location was just added this past week. So keep checking back on the ClickList website to see when your store may be offering this service. I had the opportunity to try out the new ClickList service earlier today & let me tell you, I was definitely impressed. It turns out that it just started late last week at my store, so I was thrilled that it was so close to me at my Puyallup South Hill location, making it so convenient. We headed out of town to the Oregon Coast for a weekend getaway this past weekend for the end of the summer and I knew we’d be needing groceries when we got back after a couple days away. So, I decided to order our groceries at the end of the week before we left and I figured out everything we would need for this next week. I set up the delivery for today so I could head to the store & just pick up the groceries we’d need right away (milk, fruit & veggies, etc). We got back late last night, trying to see as much as we can, but we were all exhausted from all the driving up the coast, so I can’t tell you how nice it was to just load the kiddos in the car & arrive at Fred Meyer to pick up my groceries. When they came out, they did let me know right away that the organic white grapes I had ordered were no longer available, so they asked if it was okay if they substituted organic red grapes, which was totally fine with me. You have the option to accept the substitution or not, but it will be at the same price of your original item. They also gave me some tips for my future orders – letting me know that I could add any special instructions to the items in my cart for the future. For example, if I had preferences about the produce, I could mention that I prefer greener bananas or firm avocados. So, if you have a preference, definitely list that in the instructions & they will do their best to follow those. The employees who pick out the grocery items for the ClickList customers are trained to look for the best quality & freshness when picking out the items for your order, so they will keep your preferences in mind when selecting items so you will be happy with them. The whole process took just about 10 minutes to order my items at home and then 5 minutes or so to pick up my items at the store and then we were on our way back home. I had ordered a number of produce items and honestly I felt they probably did a better job picking out the produce than I would have (that’s not my strong suit picking out the best produce, so I was pleased to have someone else do this). All in all, I was very pleased with this experience and I most definitely will be taking advantage of the ClickList service again, most likely in the first few weeks of the busy back to school time. Disclosure: This post is sponsored by Fred Meyer and we reviewed the service so we could share our honest thoughts & opinions about the service. See our disclosure policy for more details. I look forward to trying this new service 1. rainy days and 2. to not spend so much in store as I wont be tempted for other items! I subscribe to your site and LOVE all the savings. Thanks for your hard work! Sounds great for a mom like me with kids! Looking forward to not have to drag the kids thru the store on those off days! This is awesome! I can’t wait to get my groceries (and my shopping points!) without bringing my two wild children in the store with me!!! I can’t wait!! I would love the time savings including that of taking two kids in and out of car seats! Looking forward to using this service for my blah n lazy days! This sounds amazing. I would love to use this service and use the time I’d spend shopping for something more fun! Totally worth the fee! Not taking kiddos through the grocery store would definitely be a perk to ClickList! I love that I don’t have to drag my kids into the store! Time saver! Looking forward to saving on impulse buys as well. I shared word of mouth and I subscribe. Looking forward to the time saved. Grocery shopping usually takes 1 hour a week. 1 hour times 4 weeks is 4 hours a month! That’s a lot of time for a busy parent! This sounds great, and will be a BIG time saver! No meltdowns or bathroom stops halfway through grocery shopping! I’m looking forward to saving an hour of my time! I’m looking forward to using the click list when my child and I are having one of those days! I’m already subscribed to Thrifty NW Mom emails. Not having to unload 3 kids out of the car and shop with them would be great!! I’m looking forward to not having to take my Littles out of their car seats and using the double kid cart/car they always talk me into! I’ve shared via email and word of mouth. Thanks! What I’m looking forward to most about the ClickList service is not having to wear my 12-week-old or lug her around the store in her car seat. This is awesome! I subscribed to Thrifty NW Mom email! Not having to get out of the car when I am dead tired, or it’s pouring rain? Sign me up! This is just what I needed! Fred Meyer is right down the street and I’ve got a newborn, a toddler and a big kid… grocery shopping is a huge ordeal now. I can’t wait to try this service! Love the idea of bot dragging all 4 kids into the store! I have a toddler who hates going to the store. This service might be the best thing to ever happen (maybe even better than Amazon Prime). The obvious perk of not having to get the kids out of the car! But also, the store can make me feel anxious so not having to go in when feeling that way would be great. I would love to try it some time when I have both kids and not a lot of time! Sounds like a great concept. This would be SO convenient not having to get the kids out of the car! I look forward to giving this a try! ??? Most excited to not take my young kids in the store!!! ? This is one happy mama! Looking forward to not having to walk around the store in my heels after a long day at work! I can place my order never have to set foot in the store! Not having to drag 4 whiney kids through the store who are begging for junk food! I actually used ClickList once at the Federal Way store, and look forward to it coming to the downtown Puyallup store. I look forward to using it exactly the way you did; to prepare for a day when I know I’m not going to want to shop but know I will need to shop. I am excited to try the time saving option of using coupons but not going in with my kids. I shared with everyone at school for back to school night! I have wished for this so many times. To not get my 5 kids out of the car Everytime is priceless! I am looking forward to staying in my car when the weather gets cold and rainy!! Sadly the closest one to me is 11 miles away. I hope MY fred meyers get this soon! I would definitely use it on those days we need groceries but I’m tired and don’t want to bring my child in the store with me. I have a 3 yr old and am pregnant with my second (and it hasn’t been the easiest pregnancy), and we’re on our own during the week so being able to get groceries when I’m too exhausted/uncomfortable to shop is what I’m looking forward to, most! I look forward to not getting sleepy babies out of the car, especially in the rain!! Brilliant idea! It would make grocery shopping so much easier! I usually have to take my very active toddler shopping with me, which isn’t always easy. I would love this option for those busy days! I told my coworkers about this. I’m looking forward to not having to get out of the car with my baby. I like how convenient ClickList is and how you can save a lot of time grocery shopping and have more time for a lot of other things. I can’t wait to use the click list pick up for those days the kids are sick and I don’t want to drag them into the store to share germs! 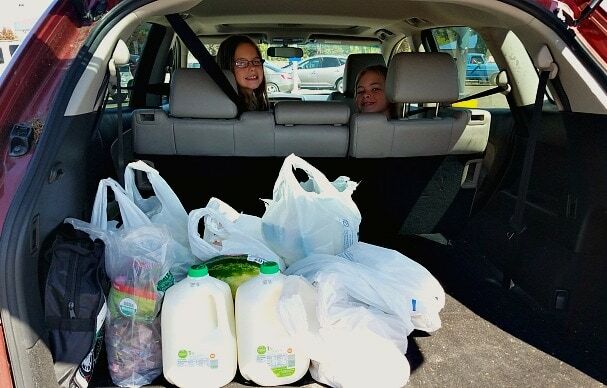 I am loving the idea of not having to unload my kids from the car to get groceries! I am subscribed to mailing list. I shared giveaway via Twitter. This is great! I could have used this when my twins were smaller. Can’t wait to have it roll out to other stores. I’d like to try clicklist on the days I’ve got to do a million things and just want to pickup my groceries so I can head home without any hassle! I look forward to shopping online after the kids are in bed and picking up groceries in the morning. I am subscribed to your daily emails. I’d love to save the time I spend grocery shopping! Just subscribed and am excited to be a part of your community. Would love to use the clicklist service when I have my toddler with me – so much easier! And Fred Myer is already my fav grocery store! I’m looking forward to being able to “shop” in my pj’s!!! I shared on Pinterest and started following you there!!! I so need this in my life. With four small boys in tow I can never get everything on my list before i give up or run out of room in the cart! Quick pick-up without taking my 18 month old shopping. What?!?!? I can use coupons and use this? My Fred Meyer got this service about a month ago and I didn’t think much of it because I like my coupons. Now I will have to try. I’m excited for the option to use this after a long trip like you did or when I’m pressed for time to shop but have a lot to pick up. Tweeted to share as TheCarrieHines ! I’m looking forward to only having to unload groceries! This is so cool! I haven’t looked to see if it’s being offered up north yet but I would love to try it out! I would love to try this! It would save so much time without having to get my 3 kids out of the car to shop through the store. This would be so awesome! It would be nice to try this out when we visit family in Colorado. Not shopping at the holidays! This would such a convenient service, especially when you have multiple children in tow! I like the idea that I would buy only what is on my “Clicklist” and not be tempted with stuff I don’t really need. I shared this giveaway with my wife. Love that they will accept coupons! I really enjoy shopping at Fred Meyer; however, this would be a valuable service for our family. Because I’m usually at home (which is at least a 30-minute drive from the nearest Fred Meyer), I could order and have my husband pick up (in Corvallis) on his way home from work or have my son stop in Eugene on his way home. I’d be much more likely to actually get what I wanted if I used ClickList, I’m certain. Amazing, looking forward to convenience! Taking the stress out of trying to find the deals and use all my coupons without having the distraction of my kids! We have 4 boys (17 6 16m twins) so we go through milk and eggs like crazy and going to the store is such a big task that this would be so nice to have. To just order things and then pick up on way home from soccer. I love the time this would save my family on the weekends! This is great! Im looking forward to a faster way to shop! I am looking forward to be able to shop for my groceries without needing to drag the kids in the store. I shared on twitter for another entry. I am looking forward to finding items a little faster and skipping the checkout lines! Looking forward to delivery to my car, life saver for a mother of 4! I like the fact that this would save a lot of time. I am looking forward to saving time and not needing to wait in long lines. I suffered a stroke several years ago and am not able to drive. I usually text a list to my husband so he can pick up what I need on his way home from work. This service would make it so much easier on both of us And I would get everything on my list! ? I’m looking forward to saving lots of money by not impulse buying! How fun and I can’t wait to try it! I follow TNWM on FB, and subscribe to emails! I shared this post on FB! I hope one of my friends wins!!! Looking forward to using the service to avoid having to take two toddlers and a baby into the grocery store! I can’t wait to not take my three kids in to Fred Meyer!